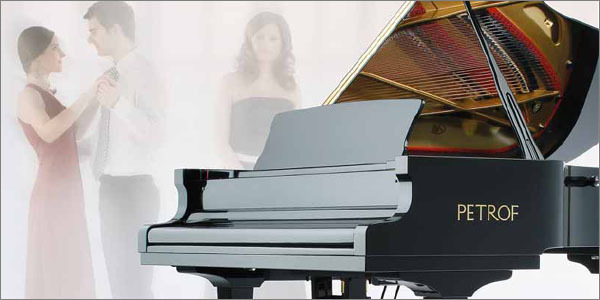 Petrof have been producing upright pianos and grand pianos with unmistakable sound and design for you since 1864. Petrof production programme includes a wide range of products from top master pianos for big concert halls to upright pianos for music schools and home interiors. Petrof’s instrument production is based on traditional techniques done by hand with focus on the resulting tone colour and top surface treatment. The modern elements of instrument design includes magnetically balanced action enabling correction of play weight and quick repetition in the whole key range. Therefore Petrof’s instrument is able to adapt to the requirements and individual abilities of the player. Both the demanding concert player and the budding young artist can choose their pianos in Petrof’s production. All instruments from PETROF brand are made in the Hradec Králové plant in the Czech Republic. So they are of purely European origin, which gives them the right to use the EUROPEAN EXCELLENCE trademark. Any other piano of foreign production bearing the PETROF logo is in breach of sovereign licence rights of PETROF, spol. s r. o..
For more information, please visit www.Petrof.com.